Everything done at Bobux comes from understanding and loving little feet. The Bobux philosophy is bulit on the idea that barefoot is best for natural foot development and to produce children's footwear that closely replicates the freedom of barefeet. It is a fact that during the first five years of a child's life, their feet undergo an enormous amount of change. Children's feet need room to grow, flex, strengthen and develop naturally. Bobux believe that the best thing to promote foot health is allowing children to crawl, walk and run in bare feet. Footwear should provide little feet with protection from harsh surfaces, but never hinder their freedom to grow. Bobux ranges feature very specific attributes that promote natural development and are complemented by innovative use of design techniques and materials. The Bobux step up Range is specifically designed to reflect the natural shape and movement of a first walkers foot. The extremely flexible and light-weight sole provides durability and protection as your child masters the art of walking. 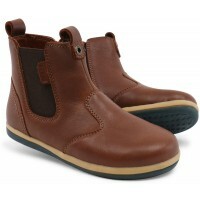 Bobux i-walk shoes are designed specifically for confident, young walkers feet. They are formed with a secure fit around the ankle and heel, with lots of wriggle and growth room at the front of the shoe. Bobux Kids+ are made for more the larger, older and more active child. Bobux Kids+ footwear are created to let children's feet move naturally while connecting, and interacting, with the world around them. Bobux Kids+ range provide lasting durability and protection from your child's environment.